Falcon with spread wings. 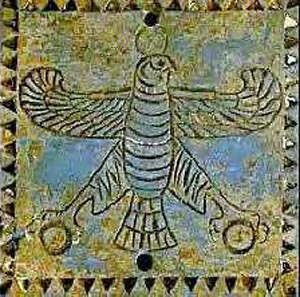 Square tile from Persepolis. Daryaee, Touraj & Soodabeh Malekzadeh. 2018. Falcons and falconry in pre-modern Persia, in Karl-Heinz Gersmann & Oliver Grimm (eds. ), Raptor and human: falconry and bird symbolism throughout the millennia on a global scale, 243-258, Wachholtz Verlag. Falcons and falconry have been part of the religious and ideological tradition of the Persianate world from remote antiquity to the pre-modern period. The falcon has been important as a symbol of royal ideology and political legitimation. Already from the earliest Zoroastrian hymns, the Avesta, to manuals on falconry in the nineteenth century, the importance of this bird and the sport is detailed. The earliest evidence of falconry in Persia dates back to the Sasanian era (3rd c. CE). In this article, the association of this sport with the nobility in both pre-Islamic and Islamic literature, art, and history is made clear.